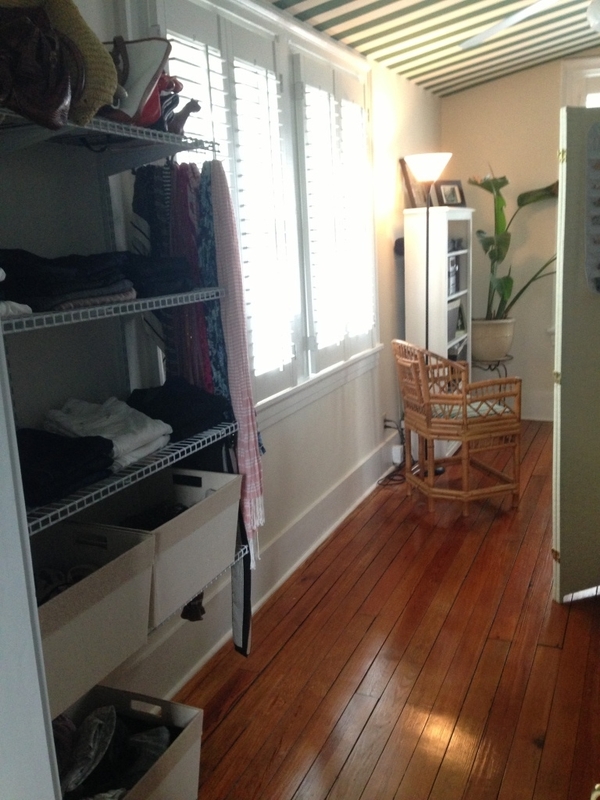 For apartment dwellers making the best of a single, cramped closet, the very idea of a extra space is but a mere fantasy. But for families living in large suburban homes, it's often a given. If you're lucky enough to have a spare, spare room or an empty sitting area, you might consider moving out of the shared master closet and creating a luxurious dressing room of your own. In the client home below, we handed over the entire walk-in closet to Mr. and transformed this small guest room into a gorgeous space for Mrs. We brought down a desk and chest from the attic, purchased some easy-to-install Closet Maid products and hung jewelry pegs on the wall. Voila! Vanity station for easy access to makeup and jewelry…with good lighting and a large mirror! Plenty of hanging space – long hang and double hang. Shelving for folded items and bins. Plenty of slots for shoes and handbags. Since my own home is 100 years old, I let my husband take over the master closet and used the adjacent sunroom as a dressing room - slash - sitting area. I enjoy having my own space where everything is visibly displayed and easily accessed. I also love the natural light coming through the windows and the music playing on the stereo in my bookshelves. Hanging bags are my favorite shoe storage option. 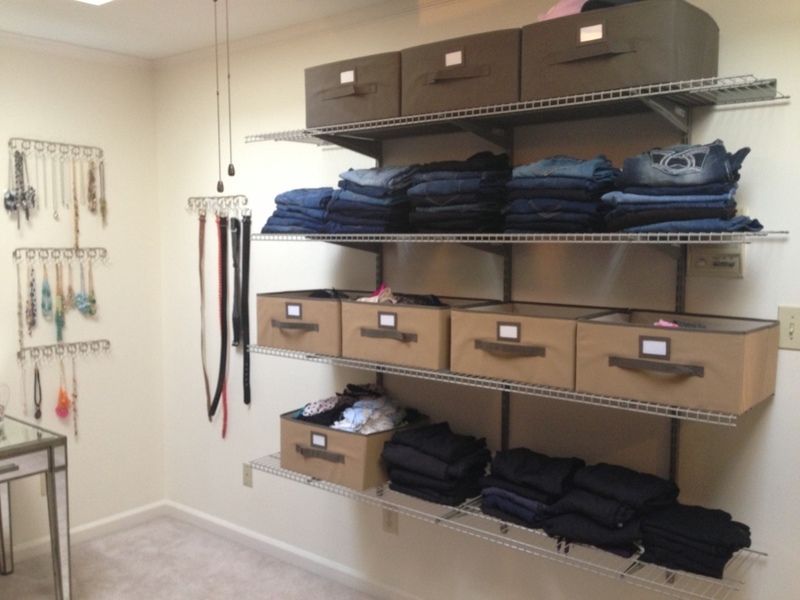 Obligatory shelving for jeans and handbags. 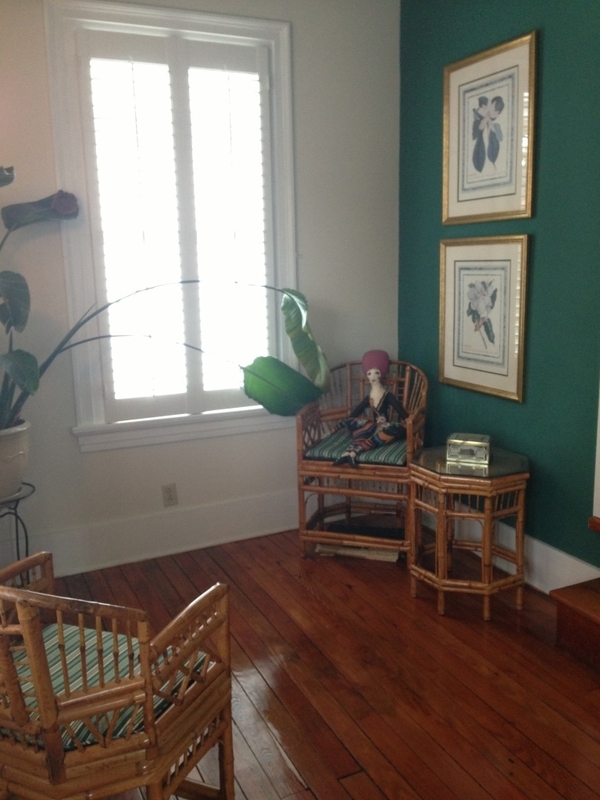 And I still have space left over for a sitting area…I’m happy in my closet! Session time is charged at the stated hourly rate, agreed upon during scheduling. Charges for exceptional travel are also negotiated during scheduling. Partial hours are charged by rounding up to the nearest half hour.There is a minimum fee of 2 hours. Full payment is due at the end of each session, except when otherwise negotiated (packages are paid up front). Phone and email correspondence is complimentary unless otherwise negotiated. Cancellations made within 48 hours of the scheduled start time will incur a one-hour charge. Cancellations made within 3 hours of the scheduled start time will incur a charge equivalent to the full cost of the originally scheduled session. In case of inclement weather or emergency, exceptions may be made to these policies.